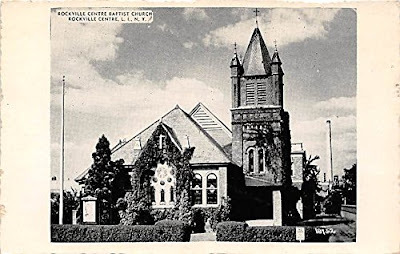 The Baptist Church in Rockville Centre that was 'haunted' by a 'ghost'! ROCKVILLE CENTRE, L.Is. Jan. 7--There are several persons in this village today who are still on the verge of hysterics as a result of a scare from what they believed to be a ghost. It wasn't. It was very material and the only thing spiritual about it was the ingredients taken prior to its materialization. All who were frightened were returning to their homes from a church service. Since four prisoners broke out of the jail recently Dr. Devillo N. Bulson, the village president, adopted the scheme of lodging drunkards and other persons charged with minor offences at the Rockaway Centre Hotel, trusting to the efficient and popular night clerk of that hostelry to guard them. John McManus, of East Rockaway, who was accused of having accumulated more of a load of liquor than he could carry, went in search of Dr. Bulson, saying he wished to be committed to a comfortable bed in the hotel. Mistaking the brass sign on a house, McManus entered the home of Dr. Frank T. Delano instead of that of the village president. Dr. Delano said he would not accept McManus' explanation and the latter began to wreck the interior of the house. Policemen Peterson and Kircher were summoned. They marched McManus to the jail, deciding to take another chance and hoping that McManus' condition might deceive him concerning the strength of the institution. An hour later, at half past ten o'clock, McManus is said to have removed a door of the jail from its hinges. With a sheet covering his head and trailing to the ground he ran out of the prison and down the main street of the village, uttering terrifying shouts. The union service, in the Baptist church had just ended, and there was a long procession of women and men on the sidewalks. The noisy apparition plunged through these, bowling over several women and knocking men aside. Other women fainted, and the "ghost" ran up the church steps and into the auditorium before all of the persons were out, continuing his shouts and waving his sheet. Several men drove him from the church and pursued him five blocks before they caught him. Then the two policemen, deciding to take no more chances on the jail, placed McManus in a wagon and drove him two miles to East Rockaway, his home, where they deposited him on the road and told him not to return.